← Focus: Microsoft Youth announcement. It is through our youth that we can change the world. Be the Spark of Change! Leading his school since its inception, Ternes has had a significant impact on the school’s philosophy. “The educational foundations of Lycée Aline Mayrisch,” Ternes says, “reflect his ongoing process of the joining of constructive forces of all actors involved in the project, namely the management, teachers, parents, students, and members of the technical and administrative staff.” The school’s motto, “To offer the young people who have been entrusted to us both roots and wings,” reflects knowledge acquisition and skills development while also inviting students to be creative, engage in personal reflection and creative thinking, take responsibility, and be autonomous. now entering its second year as a PiL Mentor School. Today, Ternes shares more on his education philosophy and on the success his school has experienced as a result of relentless innovation. Based on the idea of ​​allowing a team to define a profile for a school over a period of one year, a common vision was adopted by our Minister for all of the most recently established schools. The duties and assignments of the teacher were nationally redefined to include hours of availability for parents, students, and to be continually trained in keeping with educational requirements. The new legislative texts bearing on the organization of the establishment take into account the ideas of networking teachers and the evaluation of schools in terms of their quality. In addition, many schools regularly draw on the expertise of our school in terms of learning skills, differentiated classroom support groups, the role of parents, mediation, and the education in the technology of communication and information thanks to our “one laptop per student” device. Each class holds a key to its classroom door, as well as to the electronics cabinet for the laptops. Students manage their own classrooms: they pursue their work in their own classrooms outside of their regular lesson plans, there is no theft, no willful damage, etc. Weekly emails to the student delegates in each class, or to all students, and a student committee assisted by a parliament, have become crucial structures for dialogue and critical awareness. Our initiatives have considerably increased the skills and know-how of students and of their sense of assurance and self-confidence in life. It took us three years to develop an operational and performance flowchart, a transparent and motivational management of the many initiatives, and a consensus of the most vital elements that make up the profile of the school today. We subsequently agreed on a decision-making process. Finally, we developed a et of cross-cutting methods and computer skills indispensable and essential for the 21st century. These methods and skills are well documented and evaluated. But it is best to let our students talk. I asked the President of our ‘student committee,’ Magda, to give a two-minute presentation of our school, with all its strengths and weaknesses. Here is what she said. Evaluations carried out by an independent institute (ILRES) testify to the good working environment created by the teachers, an environment which is rich in motivational activities and the mutual respect that exists between the students and their teachers. It is important to place this in the context of the implementation of a joint project. Accompanying young people can be so effective if there is consensus on values, requirements, and the school environment. For this purpose, it is necessary to promote a real debate at the school: our weekly departmental meetings with teachers in the same field, our weekend teacher training sessions for all the teaching staff, our plenary sessions, all contributing substantially to this debate, whose objective and aim should enable everyone to find an anchor point around which each can contribute his or her own history, individual perception, and unique personality. In this sense, a project must first be focused on training, action and research work carried out by all its teachers. In other words, to create an environment in which teachers are the authors of their plans of action while allowing students to be the authors of their own learning. We must therefore set up project teams to function within the school establishment. Our school has identified four priorities for school development based on social skills, the opening of the school towards the outside world, effective learning in the classroom in increased cooperation and collaboration with parents, and the use of information and communication technology. In an effort of consistency, coherence and scientific endeavor, it is important to enlist the support of expert minds and critical friends. We have initiated a department for “Research and Projects” to ensure that these experiences are documented, concerted, developed, and evaluated. We gradually introduced tables of computer skills to be acquired by each student. These skills are documented, evaluated, and certified. Each year, a week-long project prepares students to break from their habitual 30-hour lesson plans, and define a class project that relies heavily on the educational use of information technologies. What is the major obstacle you have had to overcome to ensure students are receiving a quality education? The redefining of the teacher’s task: A recent teacher work reform has taken into account the yearly requirement of eight hours of continuing education and 72 hours of networking for teachers, as well as their availability to students and parents. This change does not go far enough. An increased presence of high school teachers, beyond their regular class hours, is essential for disciplinary team work or interdisciplinary networking, for ongoing training, and an effective accompaniment of students. Our Ministry offers schools a certain amount of educational autonomy. Of course a defined and set national- level program must be followed, but progression, the use of educational tools, and the choice and selection of textbooks, is left to the institutions. Ten percent of the hours can be reallocated to other contents and methods. On the other hand, colleges/high schools operate according to a separate financial management scale: the school can set certain priorities within the budget provided by the state. Two key observations emerge from an educational system performance measuring study carried out by McKinsey, which were based on the results of the PISA, TIMSS and NAEP1 rankings: teaching practices and the transfer of know-how between teachers in the field should be strengthened; the greater the leeway given to the schools the better the school system performance level is. It would therefore be beneficial to expand the leeway given to schools in terms of the recruitment of teachers, educational psychologists, and technical or administrative staff. Moreover, it is also necessary that, based on public opinion, parents realize the importance of a respectful discourse about the school, as well as a commitment and the scientific and educational competencies required of teachers. The proliferation of common learning platforms to promote effective work carried out by the student outside of school hours and to organize a flexible flow of feedback between the teacher and his/her students. Such learning can be set up by young people in the form of applications, wikis, blogs, vlogs — networked together with those of the teachers. The teaching profession is one’s passion, even more so a vocation. Philippe Meirieu says: “He who does not continue to learn, to confront a reality that is more or less resistant, can hardly claim to be a teacher.” My message to young teachers would be: have confidence in the young souls that have been entrusted to you, be interested in their social and family backgrounds, assign them responsibilities, and believe in their talents. Be demanding yet motivating! Throughout the school years, one should further develop skills needed to succeed in life, namely working in a team, having a critical eye, possessing global thinking, being able to speak in public or write a research paper, and using professional technological means. These need to be covered through the different subjects being taught at school: learning techniques and methods must make sense to the learner, allowing him/her to discover, understand, and analyze problems and complex situations and circumstances. I would give him the gift of a new device called “Laptab,” which combines the strength and performance of a laptop with the ease of information retrieval tablets to easily create documents, search for information, make calculations and representations, design blogs, and organize a discussion or learning platform, etc. This tool, currently the new Microsoft Tablet Surface running with Windows 8, is coming closer to many of these considerations. And then I would tell him that intellectual curiosity is the greatest treasure in the world. Today, we are announcing our new cohort of Microsoft Innovative Pathfinder and Mentor Schools. These are schools on the cutting edge, pushing the envelope to ensure students are gaining the skills they need to be successful in a 21st century environment. The 99 new Pathfinder Schools and Mentor Schools from 51 countries were chosen because they have strong school leadership and have established a record of innovation and successful change implementation. They have demonstrated student success and are great showcases for how one-to-one computing, rethinking curriculum design, bringing innovation to scale for a district, and creating a climate for technological advancement through professional development can improve learning environments to make a real impact on transforming education. When was the last time you laughed? Why? Five seconds ago, and about 600 times a day because it is good for one’s health! 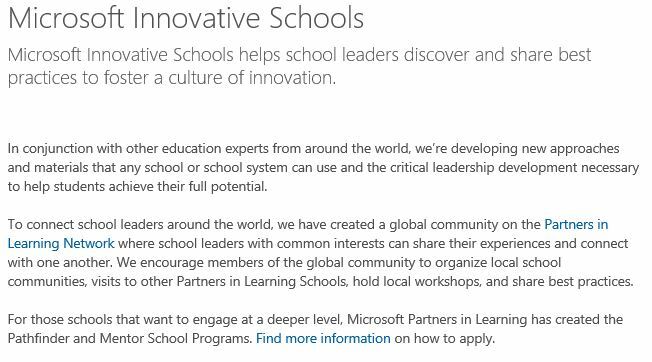 This entry was posted in Leadership and Strategic Innovation, People and tagged Microsoft innovative schools, Microsoft Partners in Learning, Microsoft Surface, PISA. Bookmark the permalink.